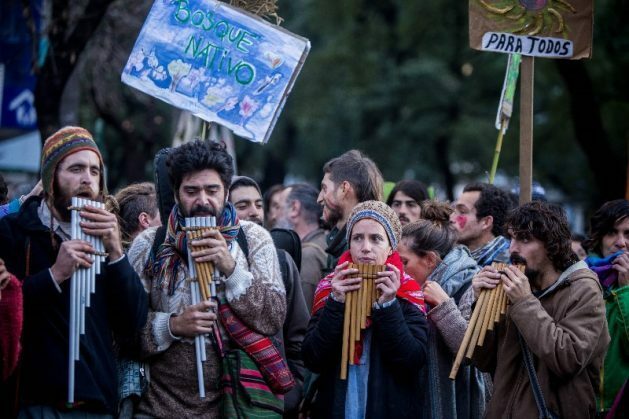 BUENOS AIRES, Jan 18 2018 (IPS) - Never in the parliamentary history of Argentina had something similar happened: one and a half million people in 2007 signed a petition asking the Senate to pass a law to reduce deforestation. The law was quickly approved, and promulgated on Dec. 26 of that year. But 10 years later, it has left a bittersweet taste. Researchers and environmental organisations admit that the law had positive impacts and slowed down the destruction of the country’s native forests, caused to a large extent by the expansion of the agricultural frontier. But they warn that deforestation continues in areas where it is banned, and that the national government has shown a strong lack of interest in enforcing the law, reflected in the lack of funds necessary to finance conservation policies. “The most positive aspect of the law was that it brought visibility to the problems of indigenous and peasant communities, and society began to look with critical eyes on agricultural activity, which had always been identified as a positive factor, as Argentina is a country that depends on agro-exports,” José Volante, who has a PhD in agricultural sciences, told IPS. “The expansion of the agricultural frontier entails the concentration of production in a few hands, advanced technology, little employment and expulsion of rural dwellers. The forest law was aimed at curtailing that model, and put on the table another approach that allows the incorporation of more people and is more socially and environmentally friendly,” added Volante, a researcher at the Institute of Agricultural Technology (INTA) in Salta. Salta, in the northwest of the country, is one of the provinces that is crucial from the point of view of deforestation. A portion of the province forms part of the Gran Chaco, a vast arid subtropical region of low forests and savannas that extends into Paraguay and Bolivia, which in the last few decades has been experiencing a process called “pampanisation”. Pampanisation is a local term given to the expansion of agriculture and livestock farming into areas near the pampas, the region of fertile grassland in central Argentina and Uruguay, driven by advances in biotechnology and favourable international commodity prices. The area sown in Argentina went from 15 million hectares to more than double that in about 30 years. And the Chaco forests have been precisely the main victim, since not only agriculture has expanded there, but also livestock farming, which is often displaced from fertile areas to make room for crops. More than half of that sown area is currently planted in genetically modified soy, resistant to herbicides, which was allowed into the market by the government in 1996. Since then it has boomed, pushing wheat and corn to second place, thanks to higher profitability. Salta lost 415,000 hectares of native forest between 2002 and 2006, according to official data, but the process accelerated in 2007, when it was made public that the National Congress was close to passing a law that would place severe restrictions on the possibility of provincial governments to authorise logging and clear-cut activities. According to global environmental watchdog Greenpeace, in 2007, Salta convened public hearings to authorise the clearing of 425,958 hectares of forest, a figure more than five times higher than the previous year, and which far exceeded the average annual deforestation in the entire country. “Precisely the flurry of deforestation permits that provinces like Salta granted during 2007 is the best proof that the forestry law was seen as a tool for actually changing things,” Juan Carlos Villalonga, a lawmaker from the ruling Cambiemos alliance, told IPS. “And to some extent it was, because although it seemed impossible, the deforestation rate in Argentina began to fall. We went from an average of approximately 300,000 annual hectares to 200,000 in 2016,” he added. Villalonga entered into politics from Greenpeace, one of the approximately 30 organisations that in the second half of 2007, with an intense publicity campaign, achieved the feat of collecting a million and a half signatures to urge the Senate to pass the law protecting the forests. The law had already been passed by the lower house, but it was bogged down by resistance from senators who saw it as an obstacle to productive development in their provinces. Thanks to the grassroots pressure, the senators had no choice but to approve the law, against a backdrop of a national deforestation rate six times higher than the world average, according to a report by the Environment and Natural Resources Foundation (FARN). But despite the entry into force of the law, the United Nations Food and Agriculture Organisation (FAO) ranked Argentina among the countries with the largest forest area lost between 2010 and 2015. The list also includes countries in Africa and Asia and three in South America: Brazil, Bolivia and Paraguay. Law 26,631 was an extraordinary case of participation by civil society in public policy, and today is an important tool for this country to meet its international commitments, in the fight against climate change and for the conservation of biodiversity. The law recognises the environmental services provided by forests and instructs the provinces to carry out land-use planning and zoning in their forested areas, according to three categories. Red areas are those of high conservation value that should not be transformed; yellow ones have medium value and can be used for sustainable activities; and green ones have low conservation value and can be transformed. Argentina’s 23 provinces have already completed this process for a total of about 54 million hectares of forest, approximately 19 percent of the country’s land area. In the face of rumors circulating recently in Argentina’s environmental circles, the national director of Forestry, Juan Pedro Cano, told IPS that the government does not intend to propose changing the law. “On the contrary, we consider it a very positive law and we are working to improve its implementation,” Cano said. “We have already created a trust fund to ensure that the national budget funds allocated to the Fund for the compensation of landowners who preserve their forests cannot be reassigned to other needs of the State, as happened in other years,” he added. That fund should is to 0.3 percent of the national budget, according to the law, but the funds allocated to it have never come close to reaching that level, with a worrying downward trend seen in recent years, warned the FARN report. The forest law is poorly enforced. Provincial governments play with the colouring of the forest ecosystems to allow cutting those forests that are supposed to be protected. It’s true that deforestation has decreased, but it has not been stopped. The law has a few teeth to boot.